Okay, wine-lovers, it's time to 'fess up: none of us appreciate looking like Dracula's geeky, hopeless sidekick after a couple of glasses of red. Gesticulating away at parties, becoming more animated and self-assured with every sip, but unaware that your massive plum-stained pouts and shadowy teeth are making you look less suave and more like my Auntie Cheryl... it's not a good look. It's not the end of the world either, but a few of you have asked how on earth you can avoid the dreaded red-wine stains. There are no guarantees, but if you're trying to be savvy then there are a couple of things you can bear in mind. Choosing grapes that are naturally lighter and less intense in colour is a pretty safe bet. Pinot Noir (Burgundy, New Zealand, Chile, USA) and Gamay (Beaujolais, Loire) produce the palest reds out there, but that doesn't mean the wine will be weedy and insubstantial. Laithwaites feature an interesting Colina Piatra Alba Pinot from Romania for £7.79 a bottle which showcases the perfect style of wine for astonishing good value. Marks and Spencer, on the other hand, stick to tradition with this ripe and soft, medal-winning Fleurie for £10.99. 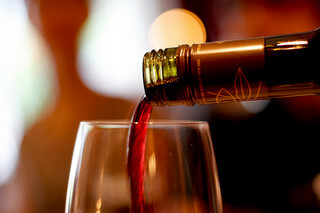 A young wine has grippy tannins and is less balanced, so it coats your mouth a lot easier. Choosing a wine that has had some time to mellow means a smoother texture to your tipple, so it won't necessarily hold on to your lips quite so hard. The Wine Society have a few examples with at least ten years ageing, but my favourite is this Cotes-du-Rhone Dme Sainte Anne 2001 for £10.95 per bottle. I tried this a couple of weeks ago and it was silky and complex, especially after a couple of hours of decanting. Majestic on the other hand have a couple of Spanish reds up their sleeve: this fruity Rioja Reserva 2006 has had enough time for its tannins to smooth out nicely. Tough stains can be removed with lemon or lime, but whatever you do don't brush your teeth straight away: a wine's acidity softens the enamel, so you need to give it time to recover or you'll end up with long-term staining. A bright, super-glossy lip-colour sometimes helps me to avoid the stains, but you have to keep reapplying. If all else fails, make-up wipes pretty much do the job. Do any of you guys have further tips? Otherwise, feel free to tell us all your horror-stories about red wine lip stains in the comments, or on our Twitter and Facebook pages. Oh, how I hate red wine stains. I really like my red full-bodied, but lip gloss certainly helps for a while. You know what doesn't help? Passing out still in your clothes and not brushing your teeth until morning*. I thought red lipstick would solve this, but when I tried it I ended up with red and purple lips, like I'd tried to tie-dye them. I'll try your tips next time!